Based on the innovative Mobitrac TR Classic, Njord is the latest addition to our multi-functional fleet. 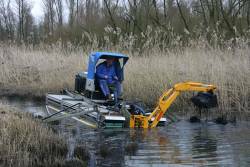 The MOBITRAC is an amphibious machine, specially designed for the maintenance and restoration of harbours, marinas, canals, waterways, marshes, ponds, embankments, flooded land, etc. 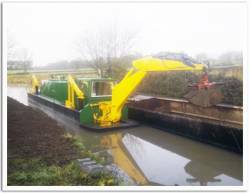 The MOBITRAC is fully multi-functional allowing Harbour Clean to exploit the machine’s potential to the full. The MOBITRAC can be operated both on land as in water. The machine is very manoeuvrable and is capable of rotating on its axis in the water. It is therefore ideal for use in inaccessible marsh areas and shallow water.